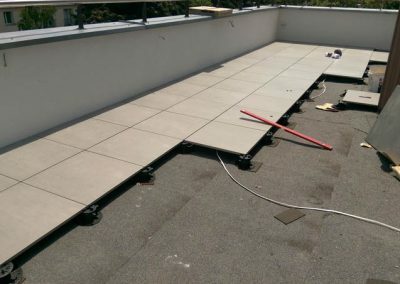 How did we repair a terrace of 80m2 using a simple technology? Why terraces and balconies generate problems to their owners? How a simple technology may solve these problems once and for all? 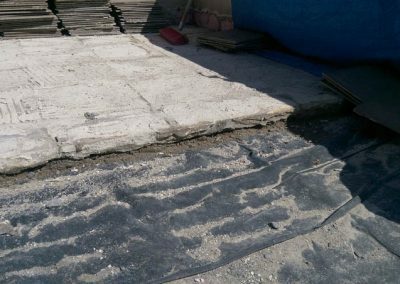 How we used this technology to restore a damaged terrace? 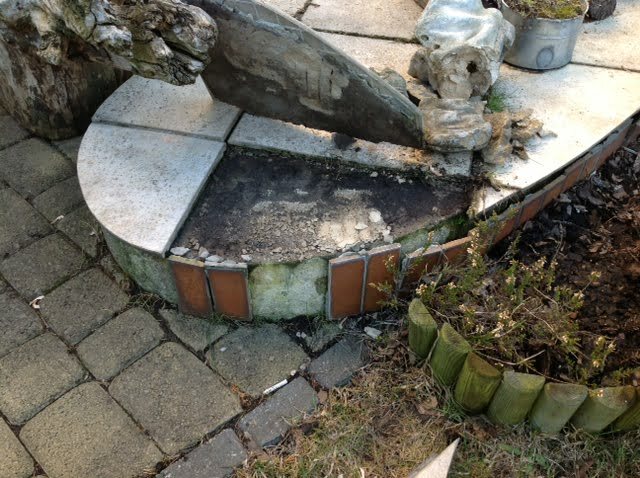 Missing joints or cracked tiles on the terrace. Sounds familiar? Did you know that improperly constructed terraces are responsible for 80% of failures in the modern building industry? 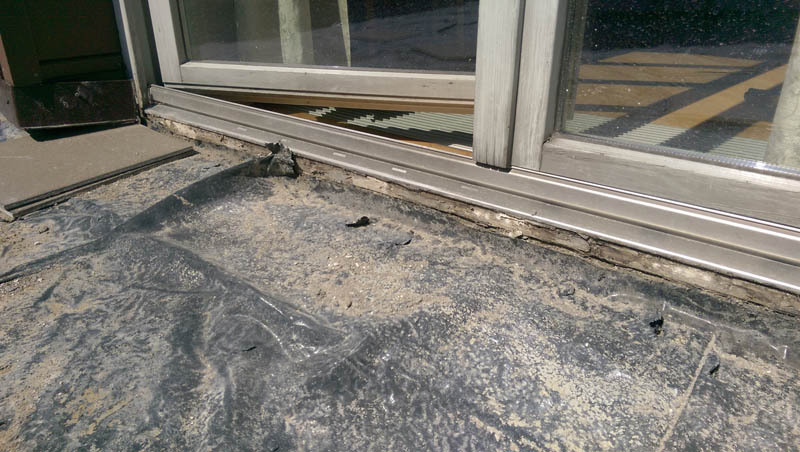 Poorly constructed balconies are the main cause of problems with waterproofing. 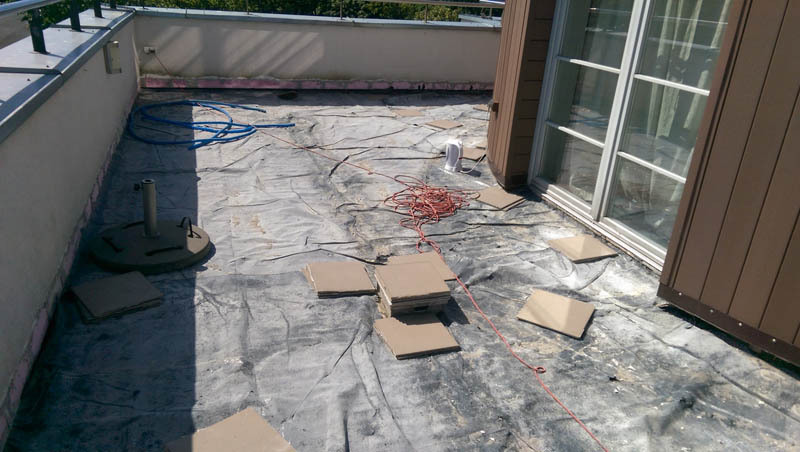 The contractors agree that defective insulation causes leaks. 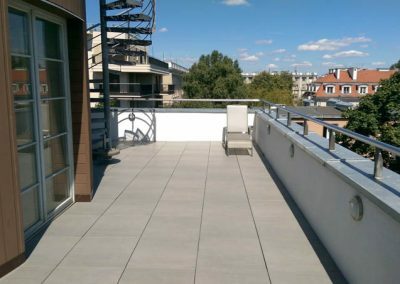 Why terraces and balconies are so problematic? Misery for residents, losses for developers, hassle for contractors and danger to users. Terrace and balcony, in addition to their practical function, are places of relaxation. They must be nice! To achieve this effect, ceramic tiles fixed with adhesives were used for many years. Unfortunately, this old technology has huge drawbacks. They are evident after a few years of use. And the effect is woeful. What are the main defects? The main cause of these problems is water! Every rainfall, snowfall and damp weather causes water penetrating micro-cracks in joints between the tiles. 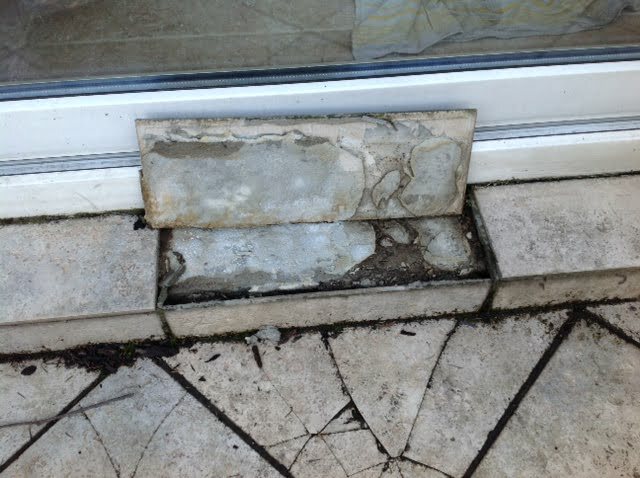 Each next winter and low temperatures cause more cracks in the tiles. 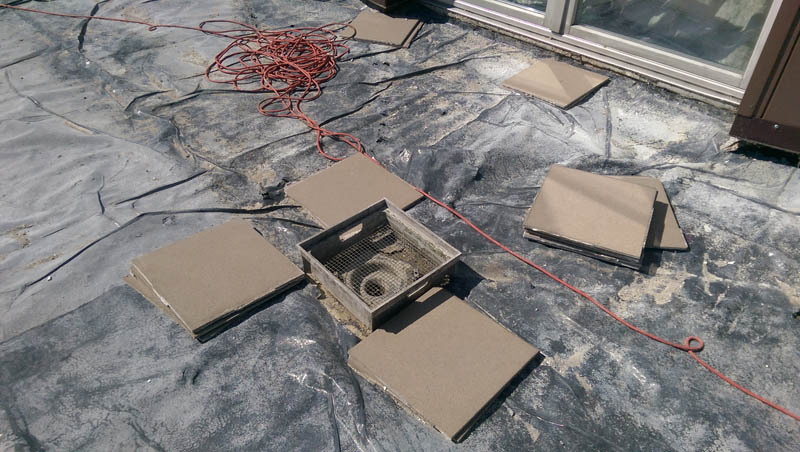 These in turn, allow water to penetrate the layers under the tile. Accumulated water stays under the terrace. This results in stains, leaks, green smudges, mould and mildew. Unfortunately, this is a classic beginning of the disaster for a terrace with glued tiles. Terrace or a storage space? 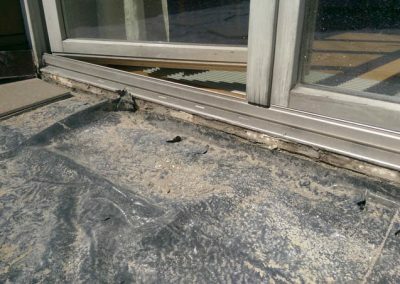 Water penetration and its cyclical freezing damage the terrace. The terrace begins to look shabby. It quickly turns from an attractive place to a problematic area! Owners do not enjoy it anymore. They treat it as a place for storing unnecessary items … or a Christmas tree long after Christmas. 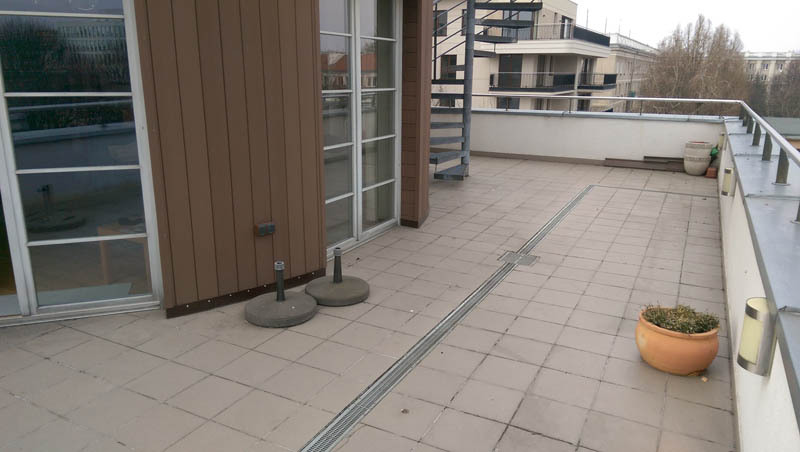 Its leisure potential is forgotten… Users are not aware that there is a simple solution to the problems with the terrace. You will not win with forces of nature. 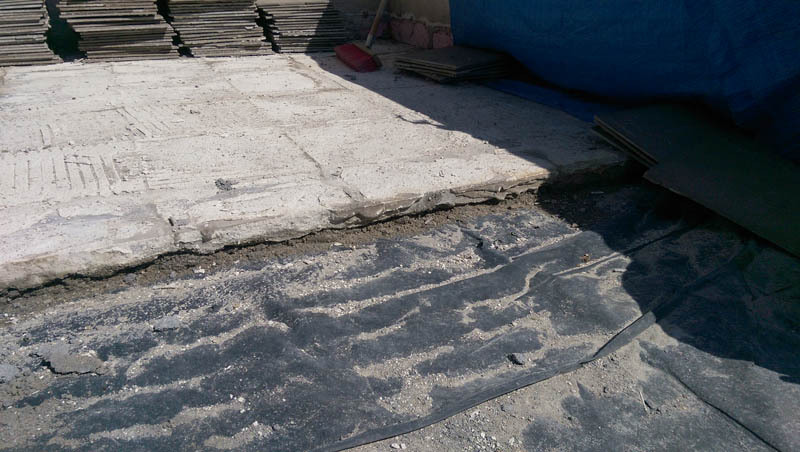 Unfortunately, despite intense efforts, maintenance of tile terraces is inefficient. It provides only a temporary improvement. It is also very time-consuming and expensive. But finally, it is discouraging. Some user blame the contractor and try repair the structure using the same technology. Unfortunately, after a few years, it turns out that the technology is to blame, not the contractor. From the very beginning it was improper solution. Because it was an attempt to overcome natural forces. Water or moisture. It had no chance of winning. But let’s assume that water is no longer your enemy. 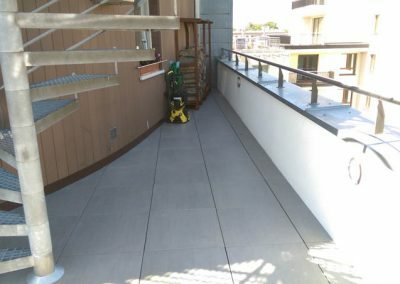 If you really want to get rid of all the terrace problems once and for all, you should physically separate the waterproofing of the terrace from its surface finishing layer. You need to stop fighting with water. The problem will not disappear when you remove water. It will disappear when water will STOP being a problemem. 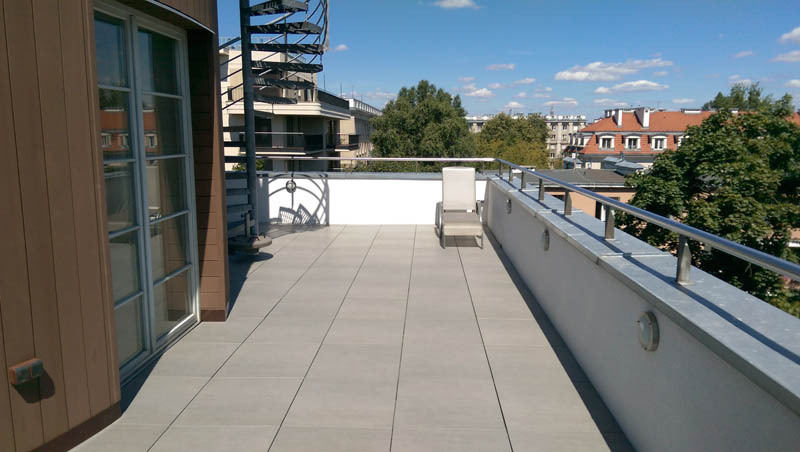 It is a terrace system mounted on pedestals that separate its surface from the substrate. 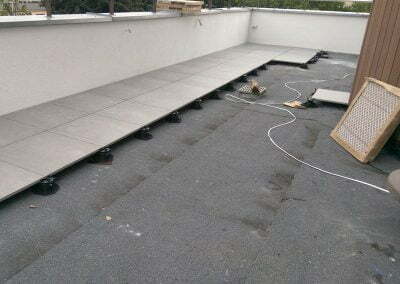 This technology removes permanent connections of the terrace surface. It maintains it usability in changing weather conditions. The insulation may freely ‘breathe’. It is also not exposed to damage. Water has no access to critical points of the terrace. You get a dream terrace with no expiry date. Moreover, you will be able to enjoy it in the same manner for many years to come. Here is one of the thousands of real stories from our extensive experience. We often hear similar statements. In this case it was the top floor of a residential building built in the early 2010s. 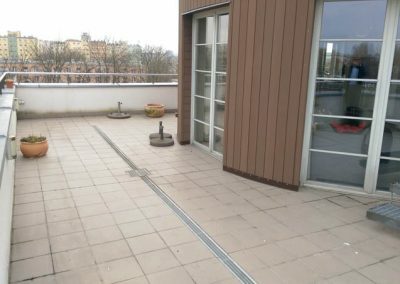 The terrace had approximately 80 m2. Unfortunately, it showed all the possible signs of wear-and tear: missing joints, cracked tiles, stains, green smudges and moisture under the tiles. Initially, the client considered ventilated boards, but on the old surface of the terrace. 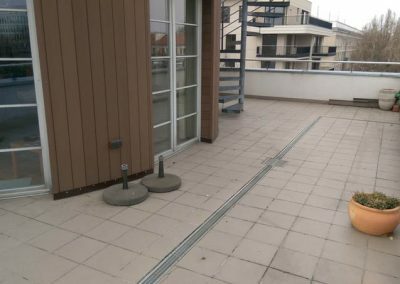 Such a solution is possible, but we do not recommend leaving the cracked terrace, if there are rooms under the terrace. 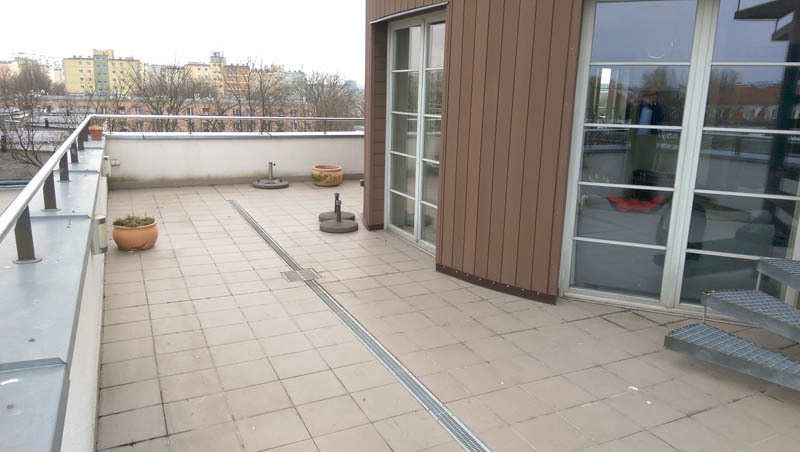 Old tiles may be left only if the terrace is based on the ground. Therefore we recommended a general renovation involving the removal of all layers – tiles and dampened screed installed underneath. 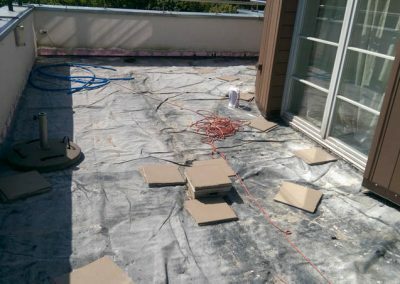 The top of renovated surface was covered with an overlapping roofing tar. 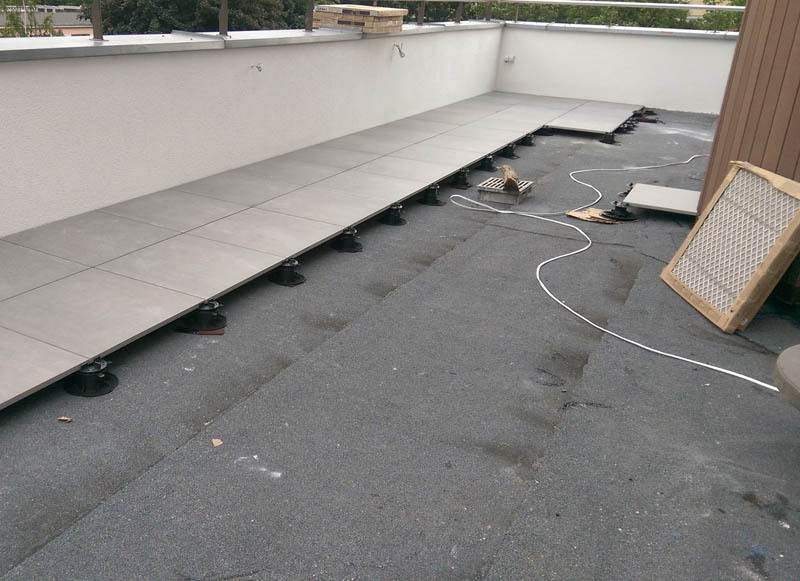 In this way, we prepared the terrace surface for installing the ventilated terrace on adjustable pedestals. 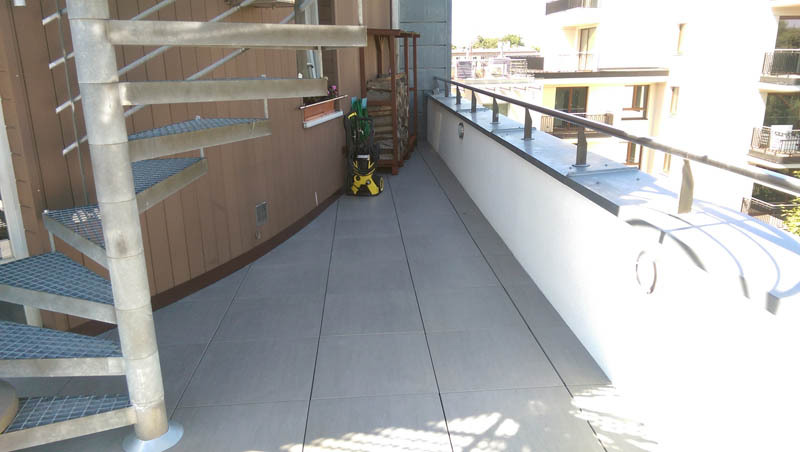 This solution helped us to restore the proper condition of the terrace, enabling its users to enjoy its functionality. What’s more, the owner is now sure that regardless of the weather conditions, the terrace will maintain its beautiful look for years to come. 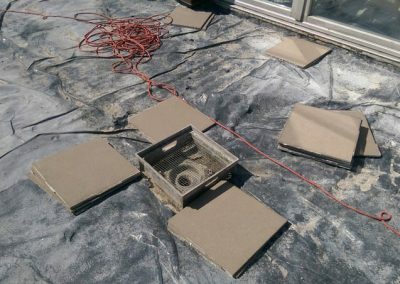 The system of ventilated terraces – simple solution to a difficult problem. Do you know the technology of ventilated terraces? Solving problems with moisture is not the only advantage of this technology! We are preparing other interesting stories for you, to show you a new perspective of constructing terraces. We have a unique Tool Accelerator for Designers. You will get it with ready-made 3D content, design files and 90 pages of practical materials in PDF format. Do you want to receive them? 4 tools selected for you to design a dream terrace - faster and more efficiently. 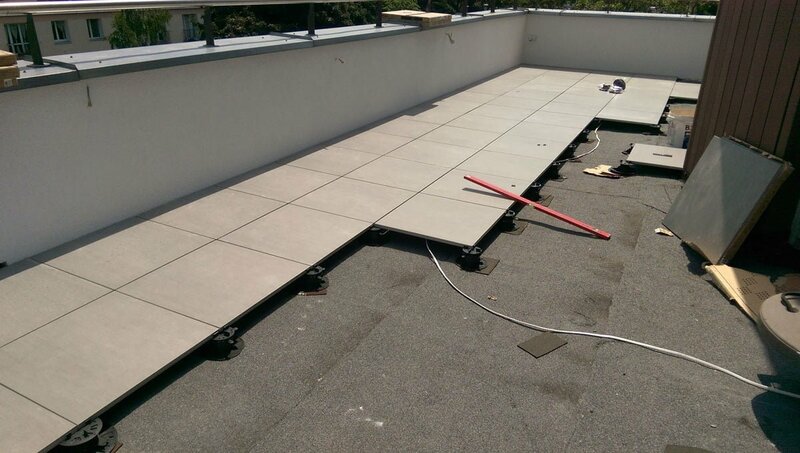 We are a family-based, Polish company providing terrace technologies. We create simple solutions for difficult problems. 41 files, 90 pages in PDF. The information read by cookies is used for advertising purposes, in particular to send our personalized advertising (profiling). You can manually change the cookie settings in your web browser. Continued use of this website without changing the cookie settings in the web browser is tantamount to acceptance of cookies and results in saving them on your devices. You can withdraw your consent at any time. The withdrawal of consent does not affect the lawfulness of the processing of data which was based on the previously granted permission.